I am a total summer girl. The long, cold winters aren’t for me. If it wasn’t for my family loving Western Ma I would move south in a heart beat. The only reason I find myself tolerating the long, dreary period is the long string of holidays. Christmas is my favorite. I have a super elaborate table setting with all the fancy dishes and cups. I have little knick knacks and decor all around it. This year I have a toddler. One that grabs most anything not up high or arms length or more away. I wanted something really pretty and something that didn’t cost a lot. I looked for things I already had on hand that I could pull together but still look really pretty. I used a vase I already owned and grabbed a pillar candle for the center. When I saw the oranges on the counter I knew they’d be a great addition. They are bright and fun and bring me somewhere warm in all this cold. I wanted a bit of color so the next time I was out I grabbed a bag of cranberries and sprinkled them all around. I used some garland I had on hand wrapped it around the base and tucked in the end. How simple is that? I ended up having an extra poinsettia garland and loved how it gave it the added glitz I had around the rest of the house. It still had that natural look that paired well with the fruit too. When the night falls I just love how the color just bounces off mandarins. Simple. Low budget. Away from the toddler. The best part is when the company leaves I have healthy snacks for the boys. 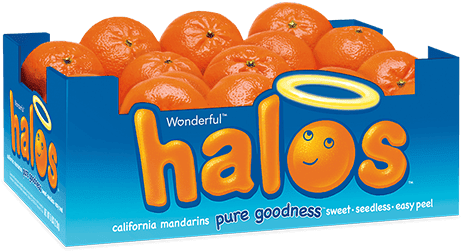 We love how Halos mandarins are easy to peel and taste great. Everyone in the family loves them and they are great for on the go when you’re traveling from house to house this holiday season! Fruit is fun! Get your family excited about fresh foods with sweet, healthy reminders all year long and activities they’ll love. Check out the FREE HalosFun kids’ app on Android or iPhone for more ways to get them cheering about pure goodness. You can learn more about Wonderful Halos on Facebook, Twitter or HalosFun. I really love this centre piece idea. I like how it’s made up of things you found around your house. This look so pretty! Too bad I don’t really have anywhere to put a centerpiece. But, if I ever do I’ll give this a try! What a great idea, and it’s really pretty. I wish I was creative like you. This is a beautiful centerpiece. Thanks for sharing! This would look great with 3 bowls down the length of the table. 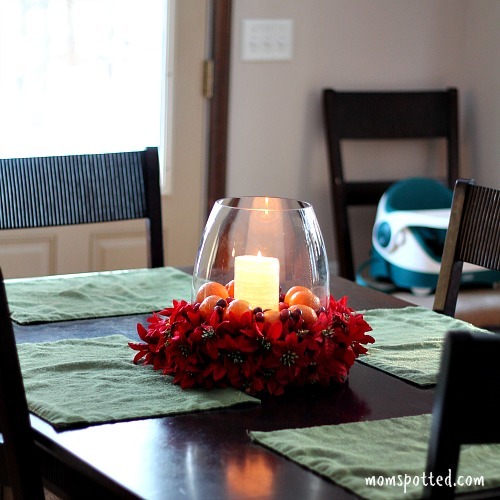 I love your centerpiece and is great for little grabbing toddlers like the one i have! Super cute and affordable! Love the mandarin never tried halosfun will have to ! I love how easy it is, yet looks so meticulous! Great job. I wI’ll try this next year. The centerpiece with the fruit is beautiful. Great job. That is so very colorful just like the holiday. What a cool idea! I bet a lot of people will be doing the same next year now. You’ve certainly started something. 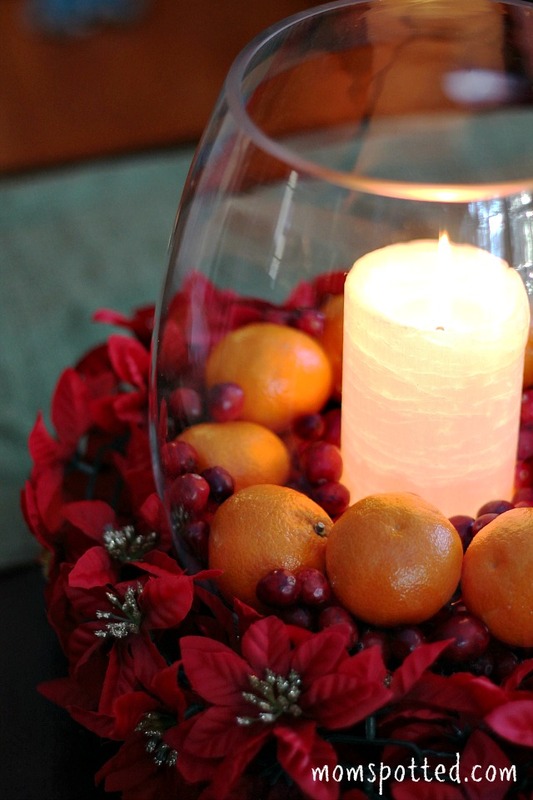 I really like this Holiday centerpiece with mandarin oranges around it. 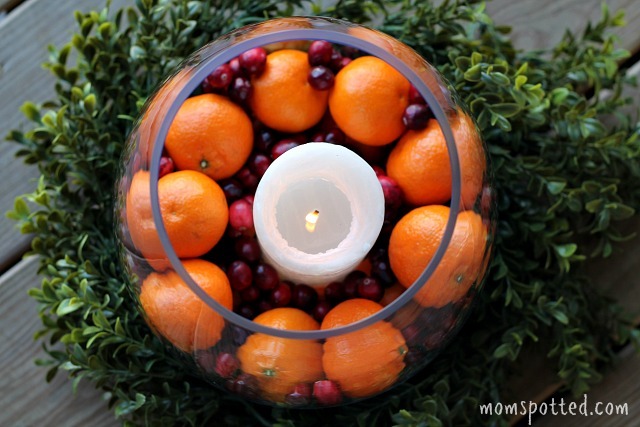 I would like to make this for my next Holiday, and Halo is the best mandarin oranges to use in this centerpiece. Thanks for the idea! This may be low budget but it certainly doesn’t look it. It’s elegant & beautiful. This is a great colorful centerpiece using natural household products. I bet it would smell good too! that is such a cute idea and looks really easy to do. I am not very creative but i would love to try this. what a great idea, i love the fun colors! I love these! And I love this idea. The oranges add a nice natural pop of color to the arrangement. Thanks for sharing! The centerpiece looks lovely! I love using candles in my centerpieces and I love sweet, yummy Halos! Oh such a neat idea! Carter loves the Halo’s too! Perfect size for him! I have this pinned for next Christmas!!! The colors are outstanding and the centerpiece is beautiful. Thanks for the idea. Wow–this is beautiful…and so easy. I wouldn’t have thought of using foods like this. Cute idea for a centerpiece and I bet that once the candle is burning for a while, the smell of the Halos starts wafting through the air. What a great idea this is. I never would have though of using them like that. How creative and cute!I pinned this so I can do it next Christmas! the oranges and cranberries look very festive!! I must say I love this look – Every year when my husband I lived out east we would go to a 1776 Christmas reenactment . I seen many centerpieces, wreaths, etc made much like this. Love it love it! This is a nice centerpiece! 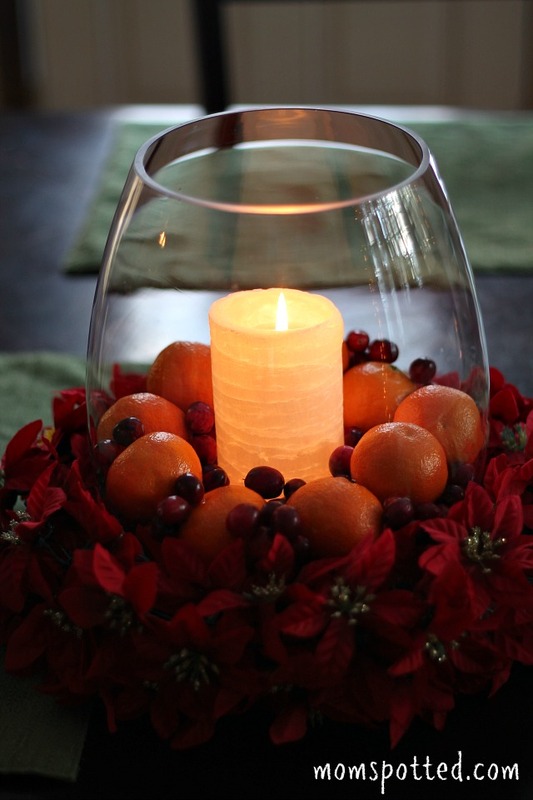 I like the colors and is a very good centerpiece to have for the Holidays. Now that it is getting closer to Valentine’s Day, I could make this for that day too! I love the beautiful centerpiece. The candle adds a lot to it. 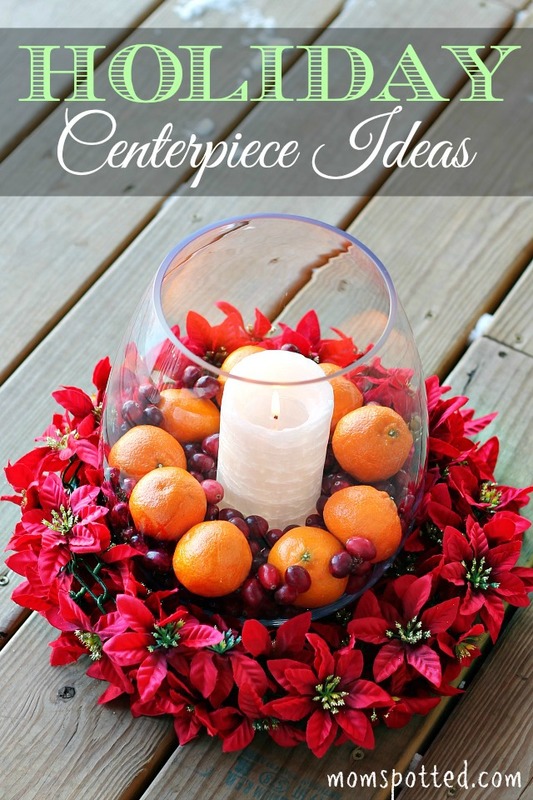 What a great centerpiece idea – I love it! 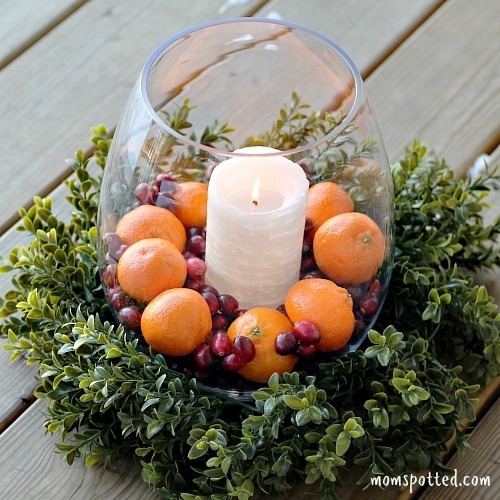 I love this idea for a low budget centerpiece, would make an excellent host gift as well.